We are the quality oriented company, presently entertaining our clients with the unmatched range of Crane Scale. These scales are appreciated by our clients owing to attributes like uninterrupted function, accurate readings, and compact design. Under the supervision of expert professional, our crane scales are manufactured using excellent grade raw materials and components. Our range finds application in various industries like cement, metal and sugar for weight measurement of bulk carried by crane. 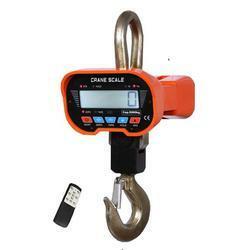 This is simple crane scale with remote control for zero/tare.